Back to food. To all you coffee lovers out there. I know you’ll want to bake a batch of these muffins. It’s like coffee cake with actual coffee ingredient in it! It’s perfect for those mornings when you need to double-up on your caffeine intake. Coffee and then coffee muffins. Doesn’t it sound good? So go and bake yourself some. You won’t regret it. Using a stand or electric mixer (or mix by hand) cream butter, muscovado and granulated sugar until fluffy. Beat in egg, vanilla extract and sour cream. Mix until it has a creamy consistency. In medium bowl whisk together flour, coffee granules, baking powder, baking soda, salt and cinnamon. Slowly add the flour mixture into the egg/sour cream mixture and mix until just moistened. Spoon batter into the lined muffin cups. Make the streusel topping: In a small bowl combine flour, sugar, cinnamon and butter. Use your fingers to mix until you have a crumbly mixture. Sprinkle generously over the batter. This is my idea of breakfast! And lunch. And dinner. Wouldn’t it be great? 😉 Thanks for stopping by today Leilani. Anne ,sometimes is good a relaxed week end without cooking…you get for the next a good ispiration,and I can see now the result..WEL DONE!!! This is GREAT for any time of the day. The streusel is just irresistible. These are a all-time favorite muffin of mine, thanks for sharing this recipe! I love the crumb topping – muffins aren’t muffins without it!! Can’t wait to try these out…they look like the perfect breakfast! I agree Ashley. 🙂 Crumb toppings are a must! Thanks for taking the time to comment today. Oh, I love anything with a crumble topping. Plus, I have always thought something called “coffee cake” should have coffee in it. Thanks for remedying that! I love anything with streusel on top of it. I could go for one of these with my afternoon coffee! These look amazing! Love the photos. I am a non-coffee drinker but may convert after seeing these beautiful photos! You’re so sweet, thank you Eva! And thanks for taking the time to comment. A couple of your muffins with my morning coffee, perfect way to start the day. These look so delicious, and great to have for breakfast! Yum!! A coffee cake muffin with a coffee flavor sounds wonderful. I love your bright photos! I made coffee cake a while back after Hurricane Sandy and was thinking I need to make it more often. The topping is the best. I’d love to taste your version with actual coffee in it. It looks great! Anne, these coffee muffins look great, especially topped with streusel. Oh my…these look absolutely divine!! I love baking with coffee anything. I even bought a coffee maker so I could use it for my baking…I don’t like the taste of coffee in a mug. But I love it in baked goods! Muscovado sugar, coffee, cinnamon…. all great ingredients! Love the topping too. 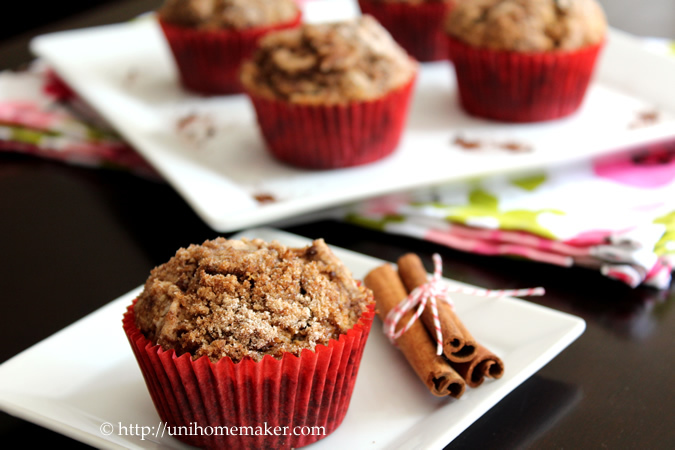 Coffeecake muffins with the taste of coffee…perfect! Sorry for the double comment…I kept getting a pop up saying to log in before the comment would go through. These look delicious! I can get my coffee in my breakfast this way! 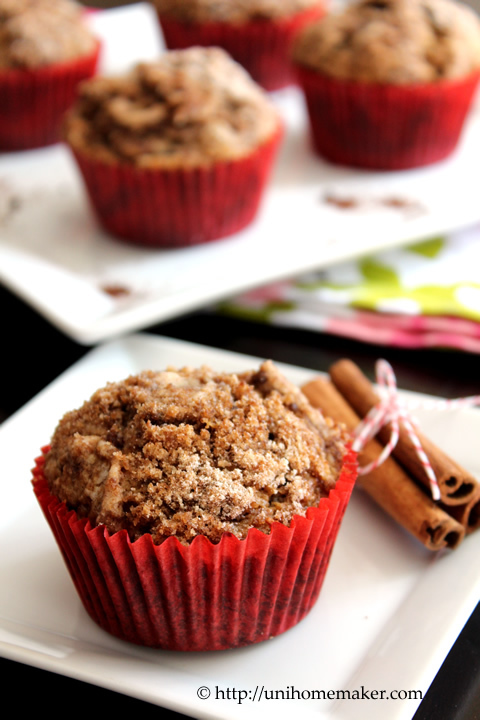 I love cinnamon baked goods… these muffins look amazing. You had me at coffee! These sound delicious. You said the magic word…coffee. I love it in any form. I have never seen a muffin like this with coffee added to it, so you know I’m going to have to make them! Thanks for sharing. 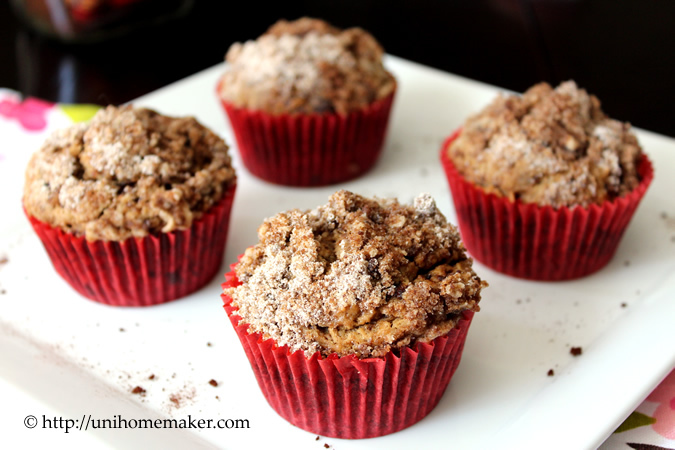 I think my morning will be smooth with a cup of coffee and this coffee streusel muffins! I need all the caffeine power to keep up with my kids. 😉 Looks delish! Thanks for a delicious recipe Anne! I’m glad you mentioned that these coffee streusel muffins actually do have coffee in them… I was never a fan of “coffee” cakes because I always expected coffee in them but it wasn’t so…These look scrumptious and lovely! Beautiful Anne! Looks great, I want one for breakfast! is there any replacement I could try for dark muscovado sugar? Not sure if the grocery stores here carry that. You can replace it with brown sugar. Dark brown sugar if you can get it. Can never go wrong with coffee and streusel deliciousness!! Why doesn’t more “coffee cake” have actual coffee in it! This seems like such a logical addition, Anne. And that streusel is calling my name – gorgeous photos, as always! I think I need double caffeine every morning! Your muffins look incredible!! congrats on the new dining set! 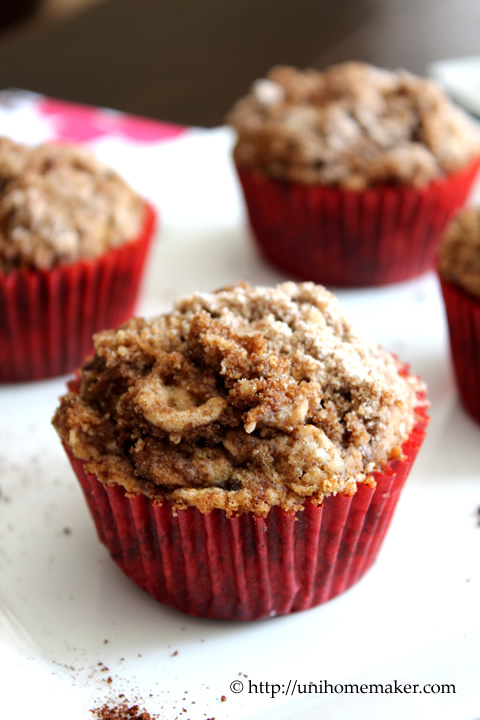 I’ve always wished that coffee cake actually tasted it a bit like coffee..loving these muffins! Gorgeous muffins! Anything with coffee and streusel topping has to be good! Ooh I do love a good coffee cake and I’m sure it’s even better in muffin form with that beautifully crumbly topping .Great recipe Anne! The flavor of a good coffee cake is unbeatable, especially with the streusel on top! Wonderful in muffin form! These look good! Going to try them this weekend…….